I consider myself a flexitarian – I mainly eat vegetarian food with some poultry and meats. My diet has evolved over the years as I have learned more about nutrition, and have grown older! Lately, I have been a fan of raw foods – smoothies, salads and even raw desserts. The basic premise of eating raw is that it retains most of the nutrients in the food. Our bodies can digest raw foods much more easily compared to cooked foods. I like to throw in a few raw-foods-only days every month which helps me cleanse my system. Raw dishes are also easy to put together, so on the days I am eating raw I have more time to do the things I love – like blogging! I have seen some of my friends start sweating at the thought of making desserts for their guests. Serving desserts can be especially daunting if you are entertaining a large group of people. 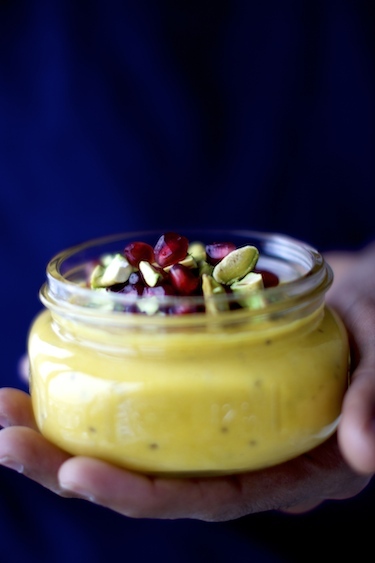 I love making raw desserts that can be prepared easily, mousse being one of my favorites! You can also prepare the mousse in advance allowing you more time to enjoy the evening with your guests! If you have made the traditional chocolate mousse before, I think you will really enjoy this variation of Papaya Mousse. I have added chia seeds to the mousse to add some texture. Chia seeds are rich in omega-3s and packed with fiber. 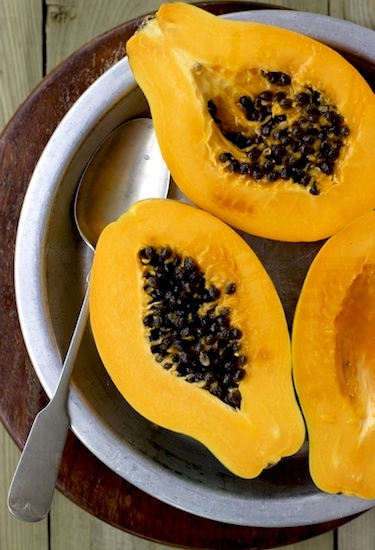 Papaya is low in calories and is cholesterol-free while being a rich source of phyto-nutrients, minerals, and vitamins. 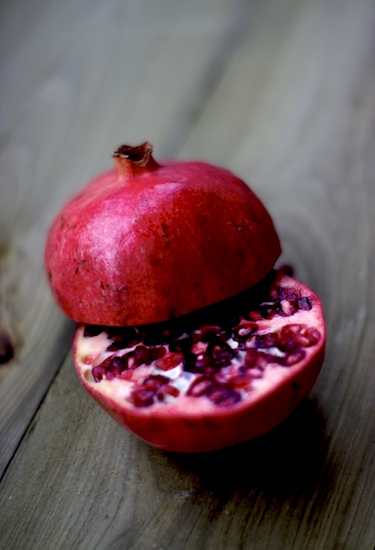 This Vitamin-C rich fruit has a good amount of soluble dietary fiber that helps to have normal bowel movements. So feel free to serve this dessert after a heavy dinner, your guests will thank you for your thoughtfulness the next morning! Put papaya, cashew nuts, chia seeds, dates, cardamom powder and salt into the food processor or blender, blend till the mixture has a smooth creamy consistency. You can add couple of teaspoons of water or nut milk, if necessary. Pour the mousse into service bowls and refrigerate until chilled or serve on room temperature. 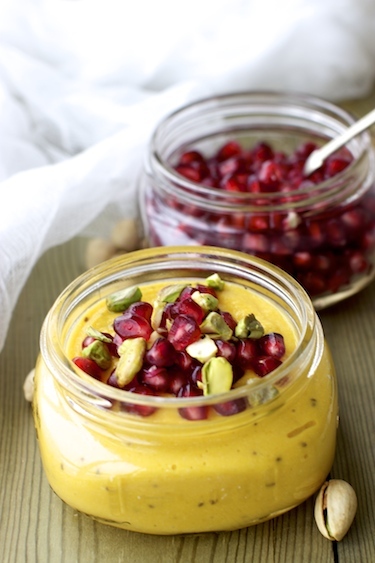 Serve with pomegranate seeds and pistachio nuts or your choice of toppings. I love papaya – but mixed with cashews and dates must take it to a whole new level of yumminess! This looks absolutely gorgeous and healthy! Beautiful photographs too – those colours! Loved your “about” page – such a beautiful story! 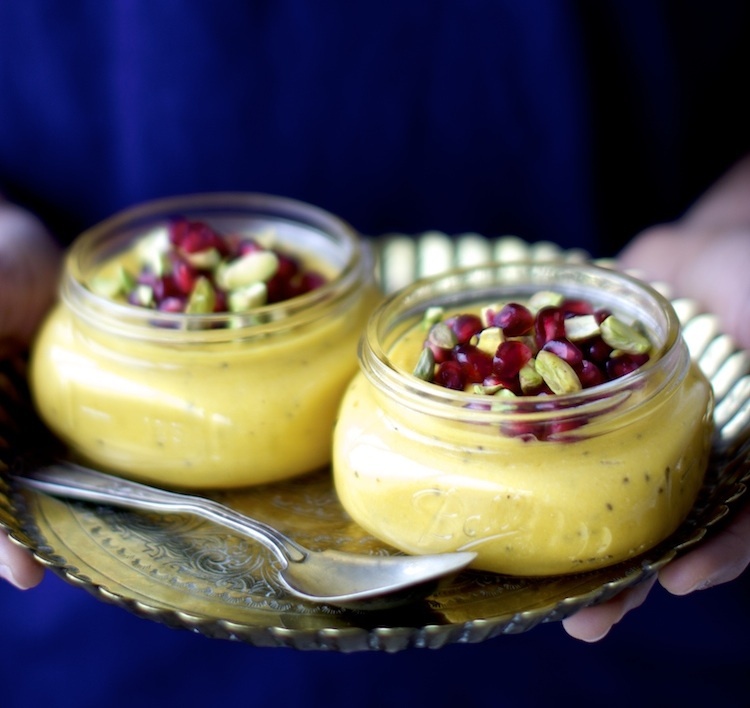 I am a big fan of raw mousse, easy to make and healthy for the body too! The papaya sure gives it a happy glow to this stunning mousse of yours. Great photography. Thanks and Merry Christmas!!! Wishing you and your family a Merry Christmas and a Happy New Year! Cecilia, Merry Christmas to you and yours! I love your blog! Such a great collection of recipes. I stumbled upon your site from Lakshmi’s, Medha and am absolutely floored by the beauty and the content of your site. I also like that you have quite a few vegan recipes on your menu and each one looks more beautiful than the earlier one I visited! I am definitely carrying with me some styling tips. Thanks for visiting, Harini! Your comment is a confidence booster! That looks amazing and I can’t wait to make it. Can you tell me your source for fresh dates as I haven’t seen them in the area where I live? Thanks so much! Hey Jennifer, I can generally find fresh dates at ethnic stores. I get lucky at whole foods sometimes too..but it’s a hit or miss. Hi Medha, such a colourful, healthy recipe! I love pawpaw, not only for its health benefits, but also the flavour. I have made a mousse recipe, based on yours, (not nearly as pretty! ), which I posted on my blog. Thank you for such a wonderful recipe! If fresh dates aren’t available, can you substitute medjool dates? If so, how many medjool dates would replace the 4 fresh dates? Thanks!